Have you ever been involved in community discussions where a group of citizens gather to do some community problem-solving or brain-storming? It’s a good way to learn more about your community and get involved. There are a number of ways to find these conversations. Check with your local chamber or city offices to find out about any opportunities. One myth that may pop up in these discussions is that there is a lack of “things to do.” Have you heard that before? Where does that come from? Seriously! My gosh, there are so many activities and events and classes and meetings; it’s downright hard to choose! The next morning, I was in Alexandria, appearing as a guest with the Kool-TV Saturday morning live show. On the way out of town, I passed a parade of cars going into the fairgrounds for the Alexandria Winter Spectacular, held on the Viking Speedway. Snowmobile racing on a track seemed to be playing before a full house! 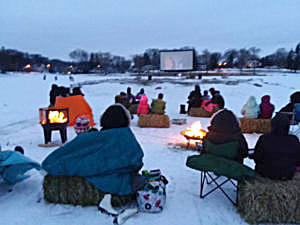 It was on to Fergus Falls for the Frostbite Festival for so many different activities, it was hard to choose! I participated in the “mother of all trivia contests” at the downtown Center for the Arts. Next time someone complains about “nothing to do”, remind them that what they really mean is that they are making a choice to do nothing. In west central Minnesota, there’s always something to do!